Here's the thing. If you're still here after reading my last blog post on Aristotle, there has to be a reason for that. Maybe (I hope) you found value in what I had to say. Maybe you felt an emotional attachment to the material (even if it was just giggling at pictures of Doctor Who). Or maybe you felt like you got a sense of me as a person, and you decided you wanted to hear more. From that person. The "me" of the blogosphere. Ta-da! You've just defined ethos. Ethos is one of Aristotle's basic rhetorical categories, and any argument that hinges on the character of the speaker is using it. Aristotle puts it like this: "We believe good men more fully and more readily than others: this is true generally whatever the question is..." In other words, we believe good men because they are good, not because they are experts. And this gets really interesting in modern culture. Consider, for example, the curious case of Tiger Woods. At a certain point, Tiger Woods could pretty much sell anything. To anyone. He was an endorsement powerhouse, associated with an increasingly diverse series of products, from Buicks to watches to razor blades. Some of these endorsements made logical sense. Woods is, after all an professional golfer, so he is likely to be qualified to sell golf clubs for Titleist or golf apparel for Nike. This is not an Escalade. We're not concerned with those ads right at the moment, though. We're interested in the phenomenon of celebrities selling things they have no special knowledge of. Things like Buicks. Tiger himself is neither a mechanic nor a car designer. In any event, he (in)famously drives an Escalade, on which more later. He has, in short, no special knowledge of automobiles that would qualify him to tell Americans what kind of car to drive. 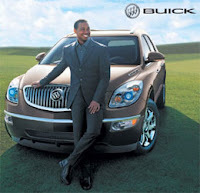 But there he is over there, looking sharp in his suit, with a big grin on his handsome face, telling us to buy a Buick. And a lot of folks did. Think about that for a second. I'm married to a mechanic. We have mechanic friends. If one of those guys tells me to buy a specific car, I consider it. But Tiger, cute though he was, just didn't logically have the knowledge a mechanic has. Weird, right? Here's why it works. When Tiger Woods' face was on all these random products, he was basically the golden boy of the PGA, and the world in general. He was attractive, but in a clean cut, nice-guy, take-him-home-to-meet-the-family way. He was multi-ethnic and clearly non-white, but in such a friendly and relatable way that even the most conservative of households had trouble feeling threatened. He was talented, and charming, and he had such a lovely family. Remember that? We loved that guy! That brings us neatly to the turn. Having taken our little trip down memory lane, to a time when Tiger Woods was the emblem of all that was right and wonderful with the family-centric melting pot we all like to think America is, we must return to reality. Remember this picture? Me too. This was the moment when we collectively decided that maybe Tiger Woods shouldn't be making our purchasing decisions. Because this was the moment when he lost his ethos. Instead of coming off as America's "good man," a man we could trust to make the right choice for us, he became persona non grata. 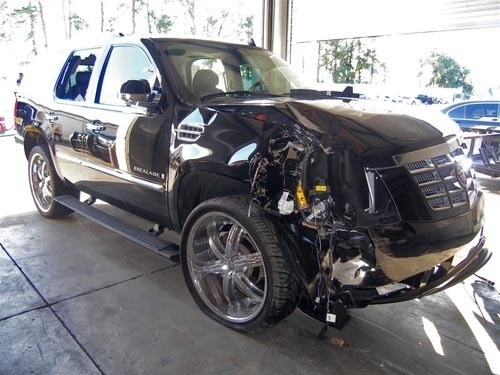 In a way, the absolute excellence of Tiger's ethos pre-Escalade was what led to his downfall. Because we believed him. It is important to point out that Aristotle saw ethos as something confined to a specific speech at a specific time, with the speaker's previous performances of character as irrelevant. He also lived in a time before YouTube. These days, to Tiger Woods' chagrin, your ethos is a 24/7 proposition. We're not internationally acclaimed pro golfers (one can only assume), but that doesn't mean ethos doesn't matter to us. We are personalities in our own way. Our ethos may not be responsible for multi-million dollar deals (yet), but it is responsible for a lot of the decisions others make about us. The ethos of others, conversely, is a big part of why we make some of the decisions we do. 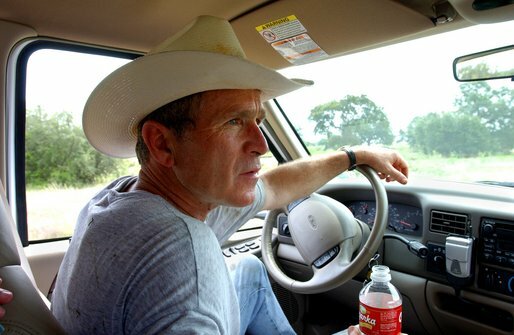 Bush takes his ethos for a ride. Like all things rhetorical, arguments based on ethos are all around us. Every time you see an Ivy League-educated candidate wearing cowboy boots and a chambray shirt, you're seeing a candidate who is aware of his ethos. If you've ever seen an actor using an award ceremony as a political platform, you've seen an astute use of ethos. In order to argue effectively (even if our argument is just "take me seriously"), we have to be equally aware. It has been said that arguments based on ethos are artificial in nature. And there is a certain degree of truth to that assessment. I'll get into that at a later date. The point today is that it works, and that we really ought to be aware of it. I would never advise anyone to manufacture a completely false ethos (just look at what happened to poor Tiger), but if you've ever answered the question "what's your greatest weakness," in a job interview with, "I'm kind of a perfectionist," you realize there's a fine line here. If you're interested in Aristotle and his means of persuasion, Massachusetts Institute of Technology has an excellent online version of his Rhetoric. If you want to chat about any of this stuff, hit me in the comments or send me an email. Lynn, you have brought up an excellent question which I hope you have the answer for. When your interviewer delivers that minefield of a question, "What's your greatest weakness," what IS the appropriate response? WWAS (What Would Aristotle Say)? Can I make a request for a blog post with rhetorical strategies to survive an interview and the work force in general? Probably not the point you were trying to get across in this particular blog, but I wanted to point out that having read this, I've learned something new, and not only that, you've just managed to explain to me in the last three minutes, what would have sent me drifting into drooling daydreams 20 years ago. I hope your students appreciate how lucky they are.